500pcs Business Cards, Word Card, Message Card, DIY Gift Card +3 pen,Blank Kraft paper by Sportsvoutdoors [500pcs Card+3pcs Pen] by Sportsvoutdoors at LDP Graphic Design. MPN: S-O. Hurry! Limited time offer. Offer valid only while supplies last. Wide range of uses: name card, thank you card, table, price, table, luggage tags, message notes, bookmarks, cake toppers, hanging tags and so on. name card, thank you card, table, price, table, luggage tags, message notes, bookmarks, cake toppers, hanging tags and so on. 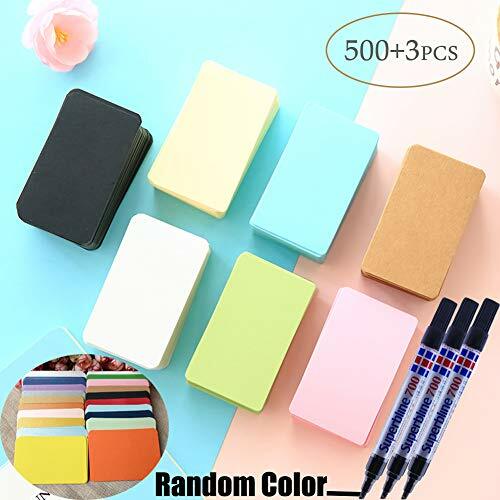 With paper boxes: kraft papers are packed in boxes, which are easy to carry and good for organizing, each box can hold 100 pieces of cards, 5 boxes, 3 pcs pen 500PCS Card totally. Both sides of the cards are writable You can according to your idea to DIY for office,home, party etc.. Classical style can make your gift or scrapbook looks pretty. Blank cards can be applied as name card, thank you card, table, price, table, luggage tags, message notes, bookmarks, cake toppers, hanging tags and more. If you have any questions about this product by Sportsvoutdoors, contact us by completing and submitting the form below. If you are looking for a specif part number, please include it with your message.